The Freeborn Wind Farm project in Minnesota has generated unusually high antipathy among locals, who protest against noise, potential health effects, visual pollution and declining property values. The vista from Dorenne Hansen’s kitchen window features corn and soybean fields specked with barns and tree groves. It may also one day include three wind turbine towers and a power line — though not if she can help it. Hansen and other residents are fighting to stop the Freeborn Wind Farm project in Freeborn County southeast of Albert Lea. Wind farms commonly generate some local antipathy as they grow both in number and economic importance to the energy industry, but the Freeborn project has sparked a higher level of opposition. It has been intense enough to prompt Freeborn Wind’s developer, Invenergy, to move more than half the project — 58 turbines — across the border to Iowa. “Iowa loves it,” said Dan Litchfield, senior manager for Chicago-based Invenergy, which is developing Freeborn Wind for Xcel Energy. As for state permitting, “the Iowa portion of the project is done,” Litchfield said. In Minnesota, Freeborn Wind has sparked a fight before the Minnesota Public Utilities Commission (PUC). There are issues over the proximity of wind turbines to some houses. And opponents of the project are concerned about unwanted noise, potential health effects, visual pollution and declining property values. Litchfield said it’s a “myth” that wind farms cause ill health, and the Freeborn project will “comply with the law” as far as noise levels and distances between houses and turbines are concerned. Both sides agree on one matter: Poor perception of an existing wind farm in Freeborn County, the Bent Tree project north of Albert Lea, has helped feed opposition to Freeborn Wind. Complaints against Bent Tree by some local residents prompted the PUC to take the uncommon move of ordering a noise study. The results in late August showed that Bent Tree exceeded noise levels at certain times. The Freeborn Wind project is part of a building boom in an industry that has already made great strides in Minnesota. The state is the seventh-largest U.S. wind power producer, with more than 2,300 turbines dotting the countryside, particularly in the wind-rich southwest, according to the American Wind Industry Association. The industry has flourished with rising demand for clean energy coupled with falling prices for equipment and federal tax breaks for wind projects. Wind has been an economic boon for some farmers and rural landowners, too: Leasing land for turbine sites can generate well over $10,000 of income annually. But it’s been anathema for some rural residents, a quality-of-life issue that can provoke hard feelings. Some property owners leasing cropland live out of state or otherwise outside of a wind farm’s footprint. “They get the cash and don’t have to deal with what we have to,” Hansen said. Hansen is a 56-year-old retiree who lives near Glenville, where she and her husband raise beef cattle on a hobby farm. She’s the fourth generation of her family to live in southeastern Freeborn County. Hansen says she’s relatively fortunate — the closest turbines to her house would be well beyond the minimum setback required by state regulations. Yet fighting Freeborn Wind has become a cause for Hansen, and several area homeowners have joined her. The PUC has received at least 15 letters of opposition from Glenville residents. Litchfield, however, notes that a July 2016 poll of 300 voters in all of Freeborn County — conducted for Invenergy — showed that 79 percent supported having wind farms in the county. “There are a lot of people in Freeborn County who want the project,” he said. Invenergy, which has developed 82 wind projects, began work on Freeborn Wind in 2008. By the end of 2009, the company had lease agreements with Minnesota landowners for more than 30,000 acres. But Invenergy couldn’t find a buyer for the project’s electricity. In September 2016, the company finally got a deal: It would develop Freeborn Wind and sell the project to Minneapolis-based Xcel, the nation’s largest wind-energy utility. At the time, Freeborn Wind entailed 200 megawatts of power production in Freeborn County. (A megawatt is 1 million watts). But when Invenergy applied to the PUC for a permit in June, the project had shrunk to 84 megawatts in Freeborn County; the rest had been shifted to Worth County, Iowa. Litchfield said Invenergy was able to lease the land it needed in Iowa in just nine months. In Freeborn County, lessors were opting out: Invenergy had 17,435 acres under lease in Freeborn County in June, 42 percent less than it had in 2009. Leases signed back then began expiring in 2015 and 2016, and some landowners chose not to renew. Hansen’s family was one of them. 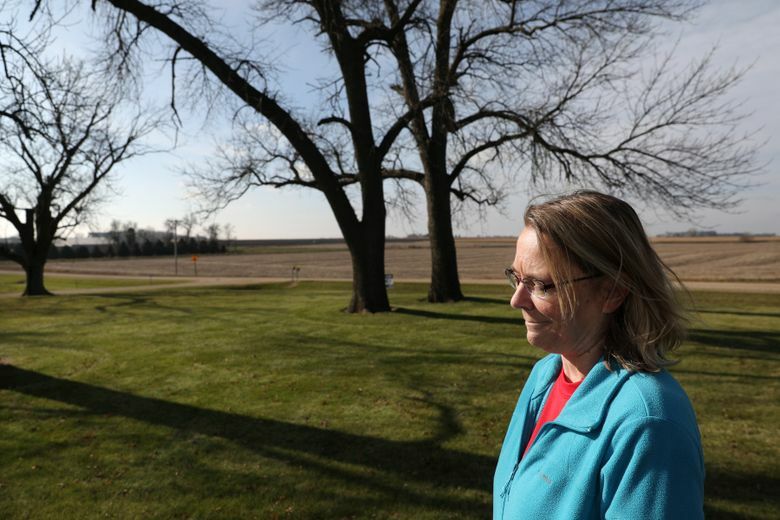 Back in 2010, Hansen and her three siblings — who together own 155 acres — voted 3-1 to sign a lease with Invenergy. She was the holdout. Seven years later, the vote flipped: 3-1 against. One big change in the interim was the Bent Tree Wind Farm, which began producing electricity in 2011. “I never wanted (Freeborn Wind), and then add in the Bent Tree project and the colossal mess of that,” Hansen said. Three residents who live within Bent Tree’s footprint repeatedly complained about turbine noise. The Minnesota Department of Commerce found that the complaints were “unresolved and substantial,” and potentially violated site permit conditions, according to an August 2016 PUC order. The Commerce Department recommended a noise study of Bent Tree, and the PUC concurred. The study found that noise exceeded maximum decibel levels seven times at one of two testing locations and nine times at the other. “Wind induced sound,” birds chirping and leaves rustling “appear to be the primary contributor to the exceedances,” the study said. The role of wind turbines alone would require further tests, it concluded. So a second study is on tap, this one isolating wind sound. Sleeplessness and headaches are the most common complaints about wind farms from nearby residents, according to a 2009 study by the Minnesota Department of Health. Wind farms have also drawn complaints about inaudible infrasound, or low-frequency sound, which can pass through walls easier than higher-frequency noise and can also be accompanied by vibration, the health department study said.